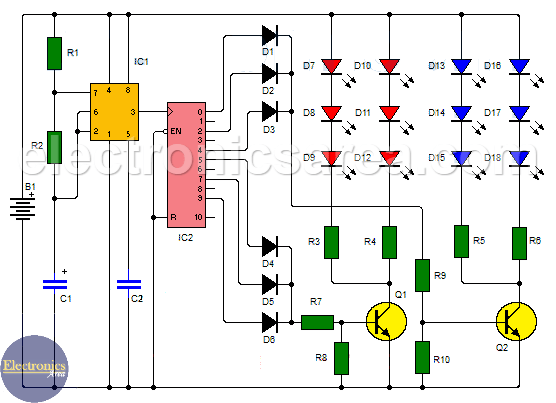 This Police Style Strobe Light Circuit using 555 and 4017 ICs shows the familiar lights used on police cars. To achieve this Police Style Strobe Light effect, two groups of LEDs are used. Each group has three LEDs and they turn on and off alternately. Whenever a group is activated, its LEDs turn on and off three times. LEDs can be red for one group and blue for the other. How the Police Style Strobe Light works? This Police Style Strobe Light circuit uses a 555 timer that works as a clock for the 4017B decade counter. 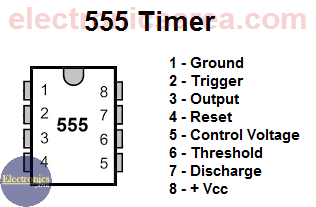 You can change the speed of the clock, changing the resistor and capacitor values connected to the timer. Although values of the components allready chosen, work pretty well. 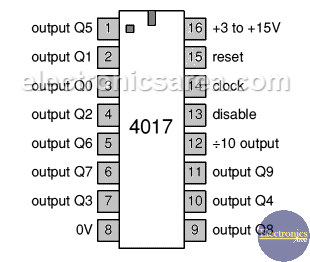 The 4017B decades counter, deliver sequentially at its outputs a high logic level. 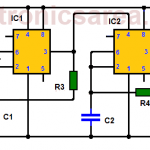 We can see from the circuit diagram that the 0, 2, 4 and 5, 7, 9 outputs are connected to transistors Q2 and Q1, and that the 1, 3, 6 and 8 outputs are not connected. When the 4017 decade counter activate one of its not connected outputs, no LED lights and some time elapses. This time is necessary in order that LEDs looks like they are OFF. Thereby the effect of flashing LEDs (the stroboscopic light effect) is created when each group of LEDs is enabled. Blue LEDs are connected to transistor Q2 and red LEDs are connected to transistor Q1. 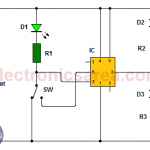 The circuit is can be powered by a car battery (B+) or a 12VDC power supply.